The membership of the Olivaint Conference of Belgium is open to all students having accomplished two years of higher education, having a good knowledge of French and Dutch, and adhering to the values of pluralism and excellence conveyed by the Conference. The recruitment policy of the Conference aims to reach all the students who are enthusiastic and highly motivated by the education given by the Conference, regardless of their discipline and their social background. The Conference is indeed bilingual and pluralistic. Do you wish to attend an activity of the Conference? Each year, an open day is held in April in order to allow anyone who is interested to attend a conference in order to get a concrete idea of the education the Conference has to offer. 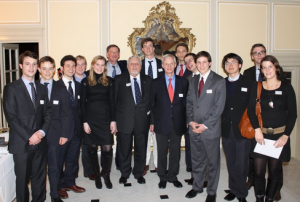 The eloquence contest in February is also a good opportunity to meet the Members and Alumni members of the Conference. Olivaint Conference of Belgium n.p.o. The deadline for enrolments is September 15th. The selection interviews for the candidates will be held on Saturday September 23rd, 2017.